Rehabilitation is critical for maximizing success among adults who have received cochlear implants. In previous RERC cycles, we developed a short-term rehabilitation program that was shown to be effective in clinical tests. One challenge, however, is that this program relies on in-person, face-to-face interaction with clinicians. But for many, this can be problematic: some may not be able to make the time to travel to a clinical site; others may not have access to convenient means of transportation; yet others who live in rural areas may be too far from a clinical site altogether. 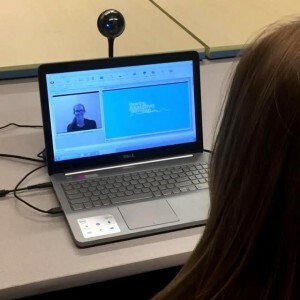 Recently, the use of telerehabilitation (telerehab) has grown for a variety of rehabilitation needs, such as training individuals with disabilities and post-operative recovery. Instead of meeting with a clinician in person, individuals meet with their clinician over the Internet using audio and video conferencing. People with hearing loss, however, face special challenges using audio and video conferencing. Currently, it is uncertain how effective telerehab would be for this target group. This project consists of adapting a previous short-term rehabilitation program to a telerehab setting. We are assessing the effectiveness of these two methods of providing training to determine whether they can improve speech understanding and communication in daily life. It will allow us to determine whether a short-term rehabilitation program for adult cochlear implant users will be as effective when rehabilitation training is provided over the Internet as when it is provided in person with a clinician. The training will take place through a state-of-the-art telerehab platform developed at the University of Pittsburgh. This platform will be set up in participants’ homes on low-cost computers. All training sessions will be delivered through it via a mix of audio, video, and other supporting content.